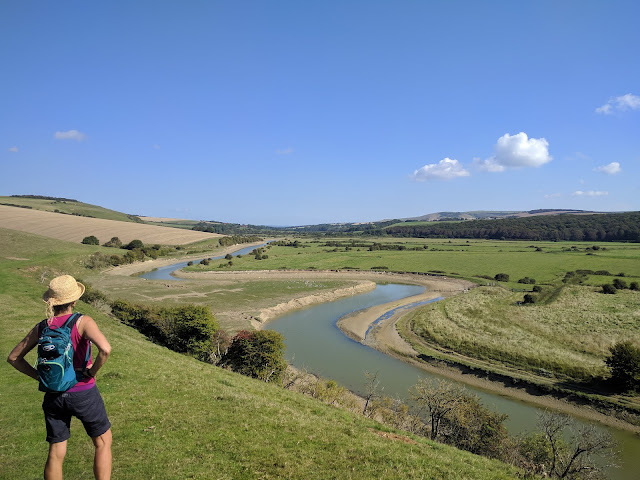 John Hayes Walks: Cuckmere Haven to Lewis. If you've spent the best part of 45 minutes on a bus from Brighton to Cuckmere Haven (the 13X is the fastest one) then most likely you'll want to follow the crowds and head south to the Seven Sisters. Stunning though that walking is, heading north presents a completely different and in many walks more interesting alternative. The walk described below is Sussex walking at its very best. Head up the Cuckmere Valley, go through Alfriston and turn west going either high or low to Charleston, walk through the Firle Park and onto to Glynde before climbing over Mount Caburn to Lewis to finish with a well-deserved beer in the pub - a great day out. 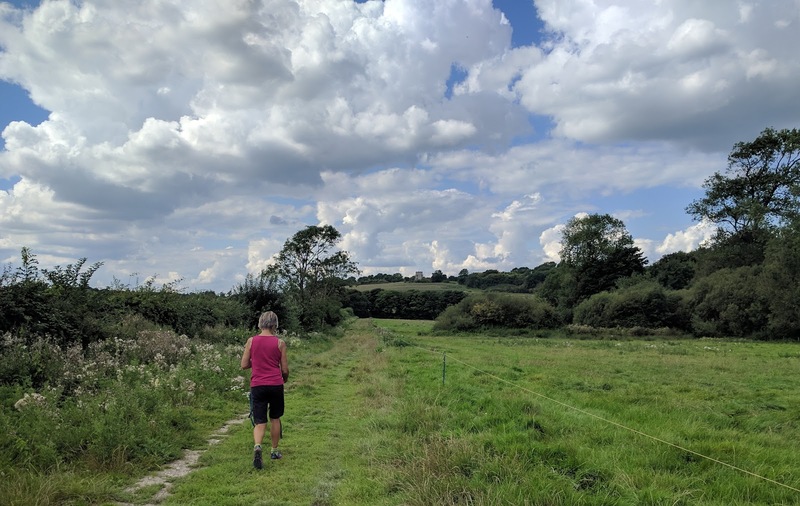 My route starts to the west of Exceat Bridge (from the bus stop), follows the road for 20m up the hill and follows a path running to the west of the River Cuckmere. There is a path along the bank on the other side of the river but the views are much better from the west side. Continue north, ascending and descending slightly, around a little oxbox lake to a bridge. Now I always cross the bridge but there is a footpath heading to the same place on either side. The path, by the way, is heading through rich water meadows so expect to come across Sussex Red cattle who, if sitting on the path chewing the cud, can be a little stubborn. The route approaches Litlington (home to one of this route's 3 breweries) but doesn't actually go into village and instead recrosses the river and heads over more water meadows to Alfriston. Alfriston is a pearl of a place and packed with tempting tea shops. Beware however you are nowhere near halfway and if you stop now you could be arriving in Lewis later than anticipated. At Alfriston my walk comes with a high and low-level option. For the high-level option cross the main street in Alfriston and follow the South Downs Way up onto downs. Continue west over Bostal Hill, past a quarry and small car park, below climbing up towards Firle Beacon. Turn right before reaching the top and follow a steep path north-west and descend down the old coach road. 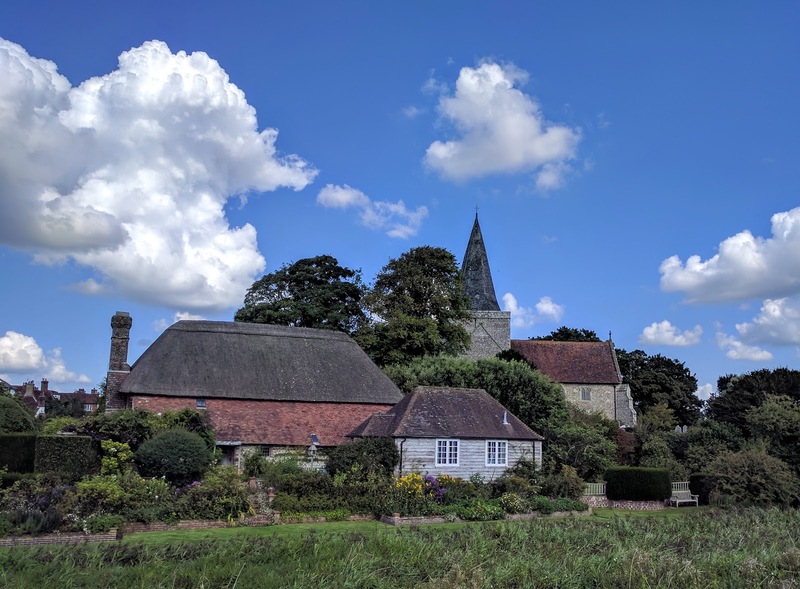 The views from the top of the downs over the Weald are wonderful but for a slightly easier route, and one which provides a chance to see the interior of Berwick Church, consider the low alternative. Continue north through the village taking the left hand at the end of the main street. After about 500m, leave the road and follow the Vanguard Way across open fields towards trees amongst which you should be able to see the spire of Berwick Church. The church is open everyday from 10 to dusk and contains murals by Vanessa Bell, Duncan Grant and Quentin Bell, painted during the 2nd World War. 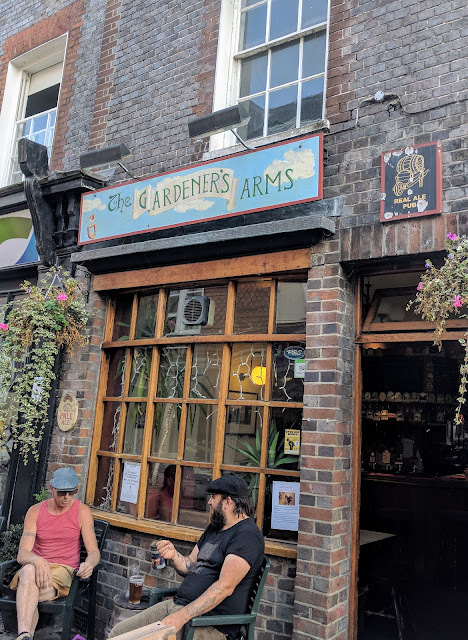 It's a wonderful place and well worth a visit. Head through the gate at the western side of the churchyard and follow the old coach road south and then west along the base of the Downs joining up with the high-level option after about 3 kms. Leave the coach road and head north through farm buildings and into Charleston, rural home to the Bloomsbury set. It's unlikely that there will be time to visit the house and gardens but there is a nice tea shop and it's not a bad place to stop for lunch. Continue past Charleston House, along a green lane, across a couple of fields (there's a folly on a nearby hill) into the lovely Firle Park the setting for Firle Place. The path across the park is a little hard to spot but if struggling aim to the right of the church and you should find a gate. Go through the gate and take the path into the village (home to the second brewery on the route). Turn right onto the main road and head through the village to the pub, the Ram Inn. 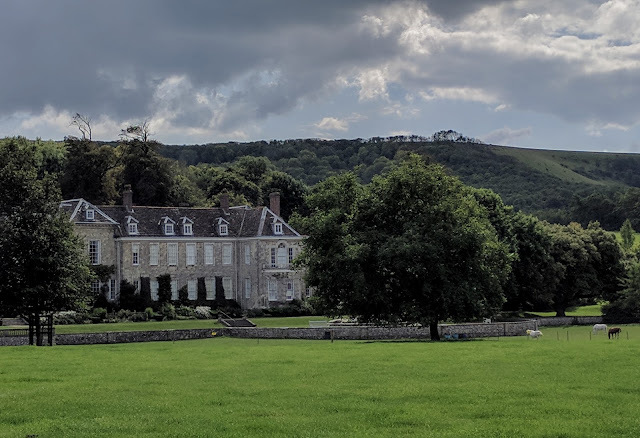 Firle is a lovely Sussex village, so nice it's almost a cliche. Amazingly it still has a village shop although intense competition is provided by locals with every house seemingly selling pots of jam, eggs and various sorts of vegetables. The churchyard is the resting place for Duncan Grant and Vanessa Bell. Head down the road to the right of the pub, past a cricket pitch and west through the main gate of Firle place. Turn right and head up the road to the busy A27 and turn left. If you have managed to get across the road take the first right and head up past the hang gliding club to Glynde. Until the pub closed Glynde was another village with everything including one of the best opera houses in the world. Unfortunately, with the closure of the Trevor Arms it's amenities have been significantly diminished. Continue over the bridge past the railway station, past the cricket pitch and turn left past the tea shop. Almost opposite the tea shop is a gate and the path that takes you up to the ridge just below Mount Caburn. 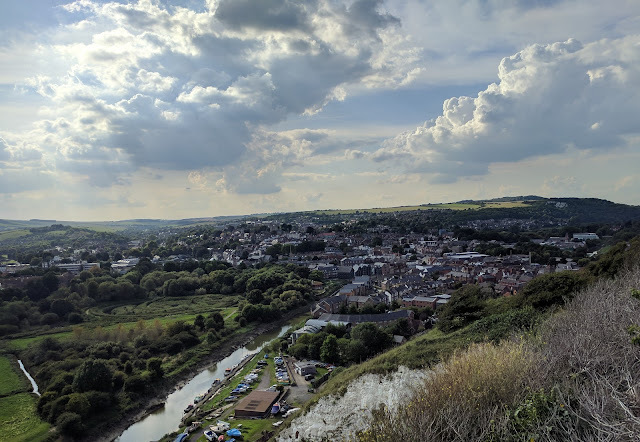 The climb is a real sting in the tale but views from the top of this strange little downs outlier are well worth the effort. From the top you can either take the direct route, which drops into the lovely dry valley below but then has to climb out it, or stay high and follow a path south and around the ridge. Both options emerge near a golf club house from where you drop down into Lewis and if your a sensible person reward yourself for a job well done with a pint or two at the Gardiner's Arms in the High St. It's been a great day!